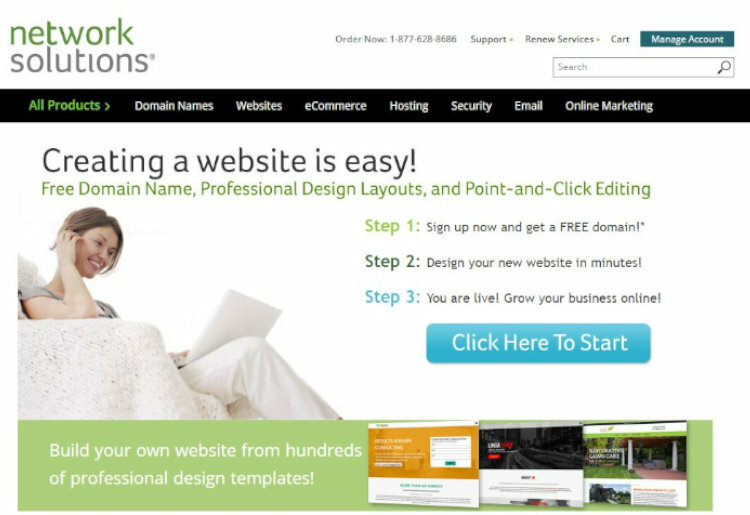 Network Solutions helps business owners grow their online presence with expertly designed templates that allow for plenty of customization. 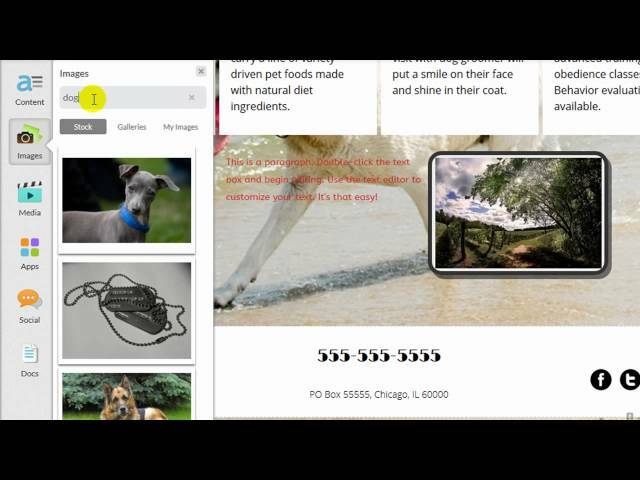 Furthermore, photos, files and specific web pages can be shared exclusively with friends and family. Just like every other website builder, Network Solutions has its own set of strengths and weaknesses. Here’s a glimpse at this platform’s most prominent pros and cons. Network Solutions is an excellent choice for small-business owners looking for a full-featured Web hosting provider that doesn’t cost an arm and a leg. The plans are flexible and affordable, and there are good options to consider for businesses at any stage of growth. Network Solutions might not be the best choice for casual users or bloggers, but businesses and organizations will find a lot to like about this versatile platform. Something that makes Network Solutions unique among its competitors is the company offers two completely different website-building tools, directed toward distinct audiences. 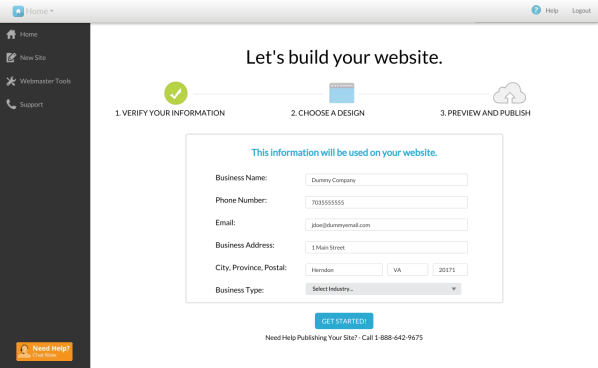 There’s a relatively limited free-website builder, and the more full-featured nsWebsite builder. I chose to use the nsWebsite package, but I did check out the free builder first. Both platforms offer users a broad selection of Network Solutions website templates, but the nsWebsite builder has a much larger gallery. 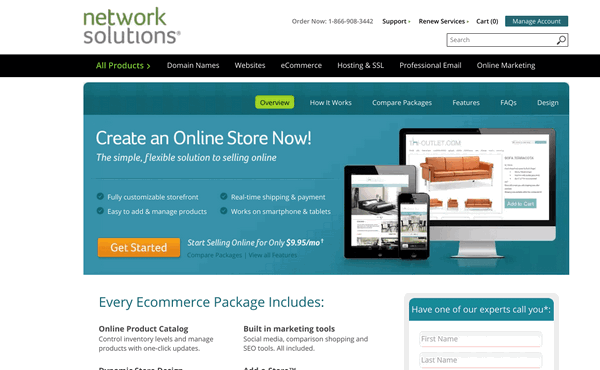 And though Network Solutions free website templates are an option with both builders, some of the free builder’s templates come with a one-time $9.99 price tag. Network Solutions templates with the nsWebsite builder are organized into 16 different categories, representing a variety of businesses and interests. Each category contains at least five different templates, but some have more than 20 designs to choose from. 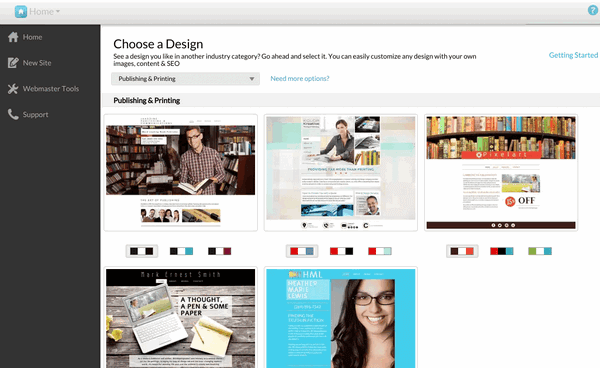 Colors are easy to customize, and users can preview any of the designs before committing to one in particular. Another option is to select a simple layout with no particular theme, or you can start from a truly blank slate. Overall, the builder was easy enough to use once I got into it, but I did find quite a few frustrating aspects of the overall account management interface. When it comes to Network Solutions pricing, I found that there’s a lot to like. But there’s also a lot of fine print to read, and a bunch of costly options to deselect prior to checkout. The nsWebsite builder is currently only advertised in 2 different options, Small and Large. Each of these plans requires an off-putting 3-year contract, as Network Solutions does not advertise offers or options for monthly plans. 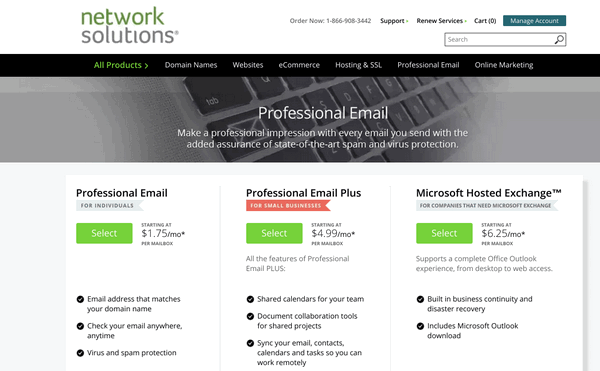 Network Solutions domain pricing comes with a separate cost, which is less than $10 for the first year, but jumps up to nearly $35 for each subsequent year. Based on my research, this is a far higher rate than many other domain registrars charge. The good news is that Network Solutions offers a 30-day money-back guarantee in case you make a purchase you’re not completely satisfied with. If you’d rather skip building a site yourself and have Network Solutions do it for you, that service requires a one-time annual payment of $1,199.95, with off-contract rates going for $114.95 per month, or $1,494.35 per year. These days, “mobile responsiveness” is a big buzzword in the website builder industry. This term refers to the ability of modern websites to make the most out of how they display on smaller screens. Standard Network Solutions websites aren’t optimized to render well on smartphones or tablets, but if you’d like your online presence to look appealing on smaller screens, there’s still an option for you. I found creating a Network Solutions mobile website to be a relatively straightforward process. For a cost of $5.99 per month, customers can use the goMobi site builder to create a version of their website that looks great on mobile devices. And if, like me, you sometimes worry about missing an important message, you can access your inbox on the go, thanks to Network Solutions mobile email. Though all website packages allow users to put PayPal buttons on their sites, the standard plans don’t include true Ecommerce options. For full-fledged functionality in this area, I had to sign up for the Network Solutions Ecommerce package, which is available for an additional $7.89 per month. This package gave me the ability to create a catalog of products for my customers to purchase, along with the freedom to set shipping options and accept credit cards. Unfortunately, this process involves yet another site-building tool that’s separate from the desktop and mobile builders, and which I found not nearly as intuitive to use. Network Solutions customer service comes in a few different forms, depending upon which plan you choose. If you find yourself stumped, a good place to check for an answer first is the support center and community forum. If you’re still struggling, and if you’re using either of the nsWebsite packages, you can call a skilled support representative to assist you. These friendly folks are available to answer your questions around the clock. To help my site rank more highly in Google, Bing, and Yahoo searches, I signed up for Network Solutions’ search engine optimization (SEO) services. The core component of these offerings is the SEO Optimizer, which exists to help internet users find you online more easily. I found the SEO Optimizer easy to use because it breaks down the esoteric terminology of SEO, and puts it in layman’s language that anyone can understand. The Network Solutions’ SEO tool provides step-by-step support on what alterations to make on your site. And it even includes a reporting feature that makes it simple to see how small changes on a site can make a big difference in traffic. Network Solutions hosting is one area where this builder really excels compared to its competition, especially if you’re just looking for a basic plan. The basic Web hosting plan comes with the free website builder and a handful of common options you find with most hosting companies, including FTP access and a library of stock images to use on your site. 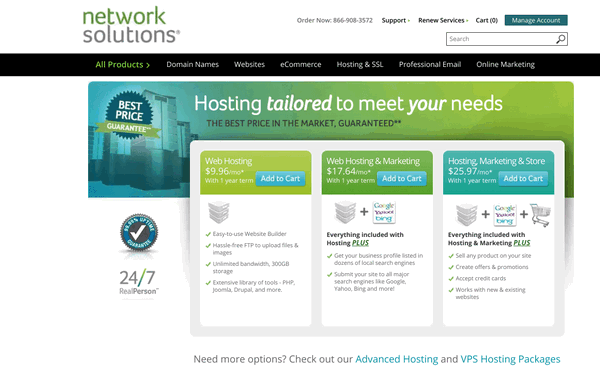 Network Solutions’ web hosting offerings start at just $2.99, but depending on your needs and how much traffic you expect to receive, the plan could cost considerably more. No matter what stage of growth your business is in, Network Solutions will almost certainly have a package that’s right for you. And if you plan to conduct Ecommerce on your site, take a look at the Network Solutions SSL packages for an added layer of security that your customers will appreciate. The Network Solutions email experience is less than optimal in my opinion. Yes, users can create plenty of email accounts and storage options are configurable in the settings menu, but the actual experience leaves a lot of room for improvement. At times, I had difficulty accessing the Network Solutions webmail login, and after creating a few new email accounts, I wasn’t able to find them in my account until the next day. Overall, the Network Solutions mail interface was sluggish and paled in comparison to many other Web-based mail services I’ve used in the past. Most reviews of Network Solutions praise the company for its affordable plans and flexible options, while critics frequently cite concerns about questionable pricing practices and the relatively outdated website builder. Some complaints go so far as to accuse Network Solutions of committing unconscionable bait-and-switch practices, but if you take the time to read the fine print, you shouldn’t find any surprises on your credit card statement. Though Network Solutions primarily promotes its paid plans, the company offers completely free websites, as well. The free website builder isn’t as feature-rich as the nsWebsite package, and users of this plan don’t have the option to link their own domain name to their website, yet they can still create a decent looking site in relatively little time. Though Network Solutions has a long history of helping Internet users find and use the tools they need to succeed, their website-building products pale in comparison to some of the best builders available. The builder was very slow to load for me, and aside from being buggy, it doesn’t seem to integrate well with the rest Network Solutions’ services. Pricing, however, is one area where Network Solutions can be hard to beat, though the overwhelming amount of upselling that the company barrages users with can be enough to turn off business owners who know better. You’ll need to make a purchase or enter a credit card number before using any of this company’s tools, and aside from defaulting to the most expensive options in many cases, the company also enables auto-renew on all products. And even if you do sign up for membership with Network Solutions, there’s no way to close your account without calling the company and waiting on hold. Webmasters with a stronger background in website building might be able to overlook Network Solutions’ shortcomings in favor of its low prices, but most first-time designers will likely find one of the other top builders to be a better fit.